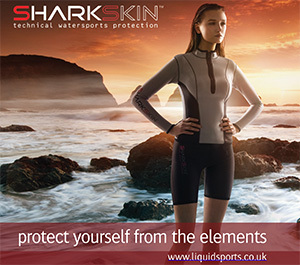 We love seeing new stand up paddle board brands spring up – especially companies with thinking behind it. Freshwater Bay Paddleboard Co (based on the Isle of Wight) is one such SUP kit peddler. Owner Charlie Cripwell sat down for a chat with us when he dropped kit off and we now have appreciation for his way of doing things. Not content to choose stock shapes and simply take a punt on manufacturing quality he’s put time and effort into developing unique designs and has visited the production plant on numerous occasions. Plus local ripper Scott Gardner and a number of Isle of Wight based retailers input their findings during the R&D process. As such you can see the quality of finish with the Classic 9.11ft. Coming with honeycomb fins and being finished in retro Californian longboard styling the 9.11ft it’s a good looking home grown piece of kit. At 31.5” width there’s a lot of foam to play around with for the rider. As such it’s a stable sled for general sweeping shenanigans. Even so there’s a lively attitude just waiting to break the surface. Rails, tail and nose thicknesses have been reduced to all but the necessary and while glide and tracking aren’t compromised the 9.11ft is begging to be chucked at a wave or two. Picking up swells effortlessly it glides onto waves and the Classic’s stability allows riders to set their rail without any unwanted surprises. The Classic’s central fin is on the bigger side which doesn’t allow for big snaps and whips, but that isn’t the point of the 9.11ft. Instead it’s a cruiser that even allows paddlers to have a stab at getting toes over – having liberally applied wax to the nose section. If increased manoeuvrability in waves is a concern there’s always opportunity to swap out the middle skeg for something smaller. 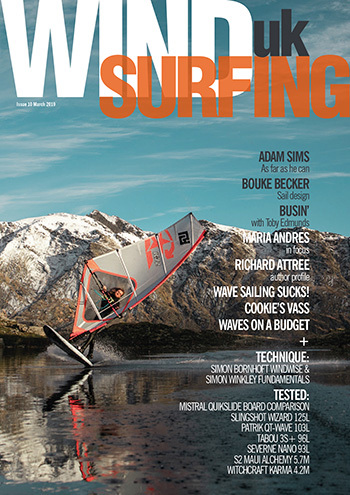 Even with all this wave pedigree squeezed in the Classic is an apt sled for flat water sweeping. Bigger riders would find it a good one SUP quiver whereas lighter riders will be having fun in the sun simply cruising. 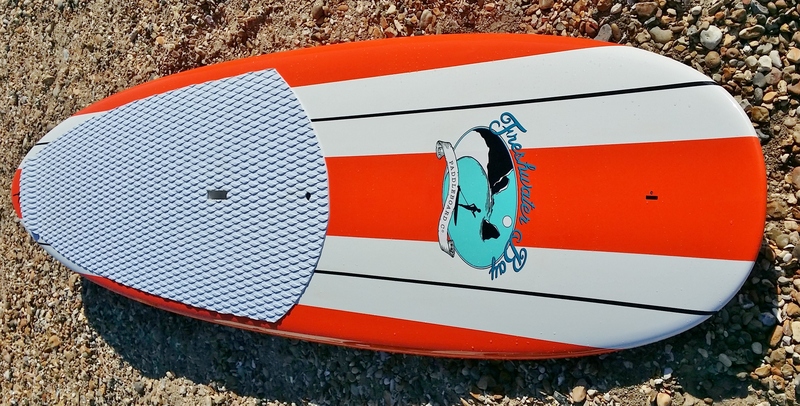 If Freshwater Bay Paddleboard Co’s Classic 9.11ft is anything to go by then the brand has a bright future. An admirable ethos, top drawer product – with well thought out attention to detail – warrants success. A board with two faces, the Classic 9.11ft is an adept performer in surf for those who desire while flat water sweepers will find an enjoyable machine for cruising all waters. Although the supplied fins are well made we’d still be inclined to swap its central foil out for something more performance orientated if heading for waves. A distinct look and good price point makes the Classic 9.11ft a good option for heavier SUPers wanting a single stick quiver or smaller boned individuals after a sunny summertime cruiser. Price: £875 (also available in bamboo and teak and walnut construction). Some brands don’t really change their gear from one season to the next – Freshwater Bay Paddleboard Co’s 9.11 Classic being a case in point (this is a good thing in many cases as it means newer findings are still relevant). SUPM has had the good fortune to spend considerable time with this board following on from the initial review above. As such we’ve now been able to give it a thorough going over across a wide variety of conditions. So what else have we discovered? Well, for a 31.5″ wide board it’s super manoeuvrable – based on a medium to heavy weight rider piloting it. Rail to rail turns are grippy and smooth, with plenty of drive and down the line speed on tap. Step back above the fins, or onto the kick pad, and the Classic lights up further. There’s plenty of opportunity for paddlers with skill to send the Classic vertical or whip round a few lightning fast cutbacks. Good footwork is key to getting the most out of the Classic so a proactive approach will be needed – riding with feet planted is no good here. Moving from edge to edge yields best results (see video above – you may need to pause at intervals to see what we’re talking about). That said it’s a sled with performance by the bucket load if you’re prepared to investigate and go against what the dimensions would otherwise tell you. On paper it’s easy to write off the Classic 9.11ft. As a surf orientated stand up paddle board, for waves up to around 4ft, Freshwater’s Classic 9.11ft is one that’ll keep grins planted on most paddler’s faces – especially those who love a more longboard orientated feel. As an added bonus it also works fine on flat water making it a truly all round and versatile vehicle, albeit with a surf pedigree. Note: We changed the fins multiple times to get the best performance according to conditions. Tweaking the configuration is how to best achieve the results you want with this board. Tunability is a good thing but only if the SUP in question is responsive to said changes. See below for general modifications with fin placement. SUPM’s preferred nose riding configuration using supplied middle fin. 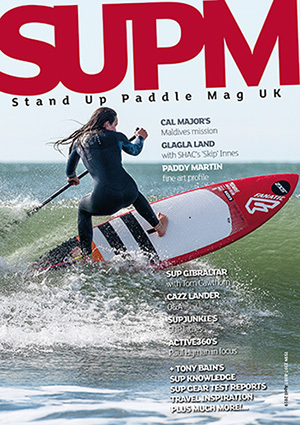 SUPM’s preferred fin configuration for performance SUP surfing.